LAOIS ARE THROUGH to their first Leinster minor football final since 2007 after a 1-15 to 0-6 win over Offaly in O’Moore Park, Portlaoise this evening. It is also the first time the county have progressed this far since they last won the competition nine years ago. Three Diarmaid Whelan frees had put Laois in command in the first half, though points from Cian Johnson and Shane O’Brien reduced the deficit to one point, with the hosts leading 0-4 to 0-3 at half-time. Laois took control after the break, however, with points from Alan Kinsella, Adam Deering (2) and Sean Byrne widening the gap to five points. Cian O’Neill got one back for the visitors, before two points apiece from Whelan and Deering made a difficult task start to look impossible, as Laois established an eight-point advantage with nine minutes remaining. Lowry then put the icing on the cake with a goal in the dying minutes to ensure his team earned a memorable win. Meanwhile, Offaly’s 27-year wait for a Leinster title continues, with the county last reaching the final of the competition in 2010. 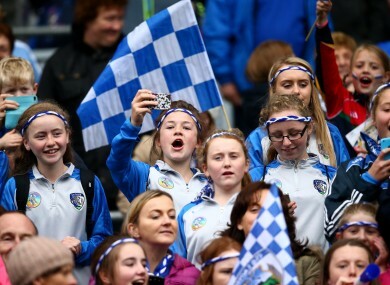 Email “Laois book first Leinster minor final place in 9 years with win over Offaly”. Feedback on “Laois book first Leinster minor final place in 9 years with win over Offaly”.